J.League, the professional men’s soccer league in Japan, just kicked off the 2019 season. A long road is ahead for the league’s 58 teams, which will compete in three divisions until the season concludes in early December. Divisions 1 and 3 have 18 teams respectively, with each team playing 34 games while Division 2 has 22 teams, and 42 games for each. The long season means there will be plenty of opportunity for fans and J.League newbs to catch a game or two. In Japan, soccer has quickly become a major pro-sport, a candidate who could possibly even dethrone baseball as the country’s number one favorite pastime. The popularity of English football is gaining steam as the rising number of pro-teams suggests. Behind the rise in attention, is the national team’s success in recent World Cups and Japanese players like Keisuke Honda and Shinji Kagawa getting recruited into European clubs like A.C. Milan and Manchester United. The thrill of the game and plethora of activities for families also help fill up the stadium bleachers. For the F. Marinos in Yokohama, family fun involves pre-game bouncy inflatables and kicking games for the kids, among other activities. “Before kickoff, we have Toricorooru lando (Tricolor Land) by the Nissan Stadium where bouncies and kicking games for kids are set up. During summer time, we hand out colored-cellophane and let audience paste them on their cellphones. At some point, the light of the stadium is put out, and their cellphones light up the stadium in tricolor,” an F. Marinos spokesperson said. Foreigner fans might also recognize familiar sights and sounds from the soccer stadiums back home in Japan. You’ll still find your favorite game-day eats like hamburgers and hot dogs at Japanese stadiums, but there are some great traditional Japanese foods you might not find at any U.S. or European stadium. Follow the locals’ lead and try some takoyaki, yakisoba or curry rice for an authentic game day experience. Another familiar sight for overseas spectators will be the passionate fans. Although the J.League says safety is its priority, this doesn’t mean the league discourages those fans from openly expressing and sharing their excitement at the game. “You will see hard-core fans in the stand behind a goal post, holding a giant jersey, pumping up the mood. When a ‘Kanagawa derby match’ takes place against teams like Kawasaki Frontale and Shonan Bellmare, the rivalry will fuel excitement. The same goes for matches against popular teams like Urawa Red Diamonds,” the spokesman added. The F.Marino’s home stadium’s proximity to Yokosuka Naval Base(osuka) makes catching a game easy. With 58 clubs in the league, the local culture and mood unique to each team’s home turf are reflected in their stadiums. At the F.C. 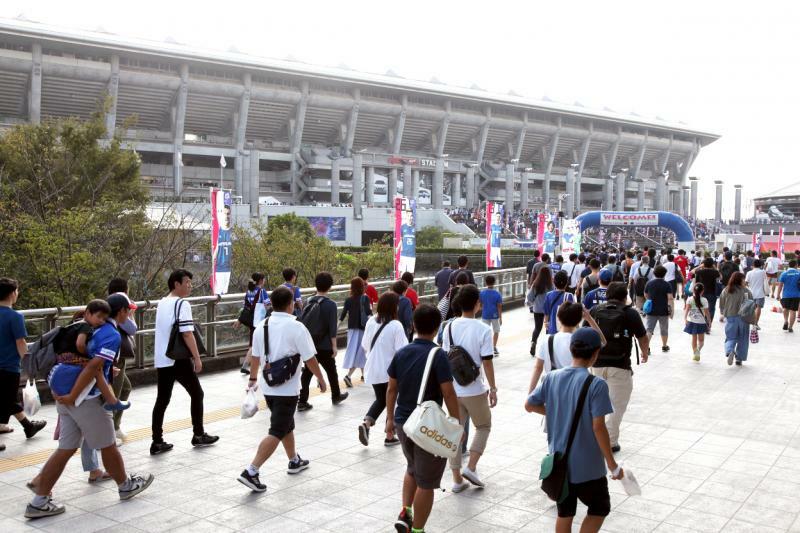 Ryukyu stadium, aside from a good game, fans can get some shopping done at the “Ryukyu Haisai Market,” featuring local vendors selling bento meals and Orion Beer –a local brand and local favorite, among other items. “You can feel a friendly mood at our home games,” a staff member of the F.C. Ryukyu, an Okinawa team, said. F.C. Ryukyu just won Division 3 last year and is now heading to its first season in Division 2. Despite some changes during the off-season, including a new coach and new players, the team’s tradition of entertaining its fans continues. “Our players enjoy interacting with fans especially after games. Such accessibility of players is often talked about in the media,” he said. 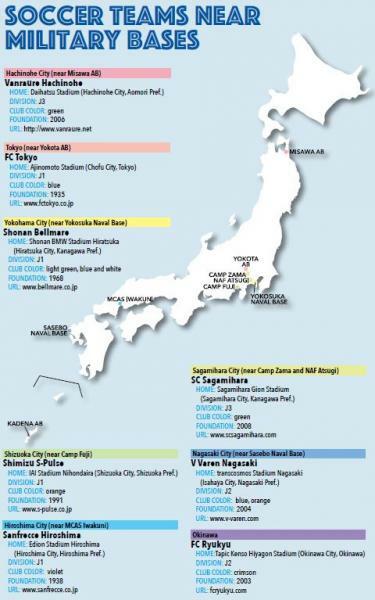 Many of the J.League team stadiums are close to island and mainland bases, so catching a game won’t be difficult. The atmosphere, food and local culture in the country’s many soccer stadiums are only a part of why the sport is taking off and all of these might just be enough to make a soccer fan out of you, too. According to Japan Football Association (JFA), J.League held its first regular season in 1993 as the first ever professional soccer league in Japan. The league’s success boosted the popularity and quality of the game. It started with 10 teams and one division. But Division 2 was introduced in 1999, followed by Division 3 in 2014. At the end of each season, two teams from the bottom of the Division 1 will be demoted to Division 2. Top two teams of the Division 2 will be promoted to Division 1. Plus, a team at the 3rd from the bottom of Division 1 will join teams at the 3rd, 4th, 5th, and 6th places of Division 2 to have playoffs for a spot in Division 1. Likewise, the top two teams of Division 3 will be promoted to Division 2 in the following season, to replace of the bottom two teams of Division 2. Some teams of J.League have internationally acclaimed players on their rosters. Andrés Iniesta, Lukas Podolski, David Villa (Vissel Kobe), and Fernando Torres (Sagan Tosu) are expected to play this season. In the past, legendary players such as Zico, Leonardo, Lineker, and Buchwald played in the Japanese league. Usually cameras are generally allowed, but some team stadiums prohibit them. Check with the ticket counter for this. Tickets are available at: https://www.jleague.jp/en/ticket/ (credit card payment). If you would like to buy tickets at the stadium, bring yen. Some game tickets sell out quickly, so buying early is recommended. Also, bring yen if you plan on buying some snacks at the game. J.League recommends sunscreen, hats, spf clothing, and sunglasses to protect from the sun. Using parasols or sunshades are prohibited when a match is in progress. A raincoat is also a good item to bring as soccer games take place rain or shine. Tapic Kenso Hiyagon Stadium, the home stadium of F.C. Ryukyu has a free parking lot. When the parking lot is fully occupied, another free parking space at (N 26.314771, E 127.824082) can be utilized. * Congestion is expected on game days. Some stadium recommends the use of public transportation. Check with the stadium. Some allow outside food and drinks (including alcohol) but prohibit glass bottles and cans.